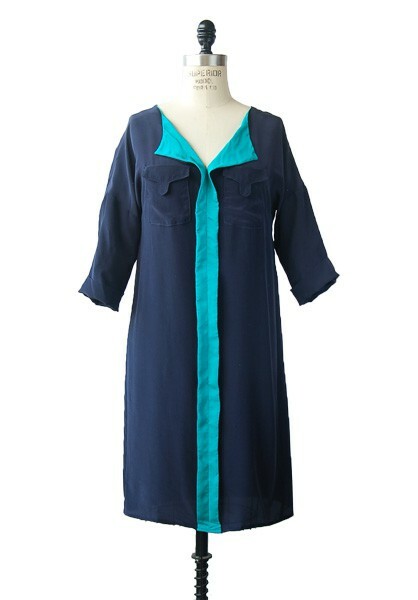 This pull-on blouse or dress is perfect to wear any day and anywhere. 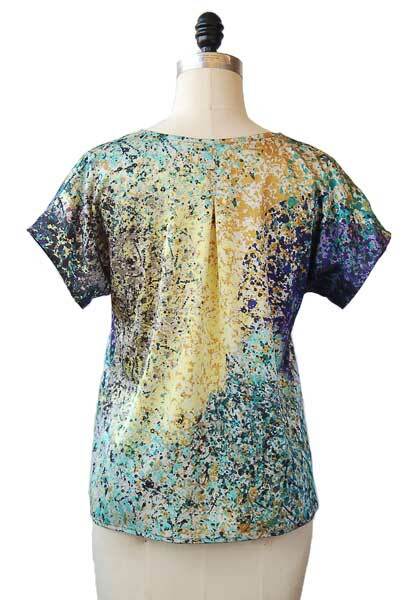 With a relaxed fit and a flattering V-neck, the pattern features kimono sleeves (meaning no sleeves to set-in) and no closures, making it very easy to sew. 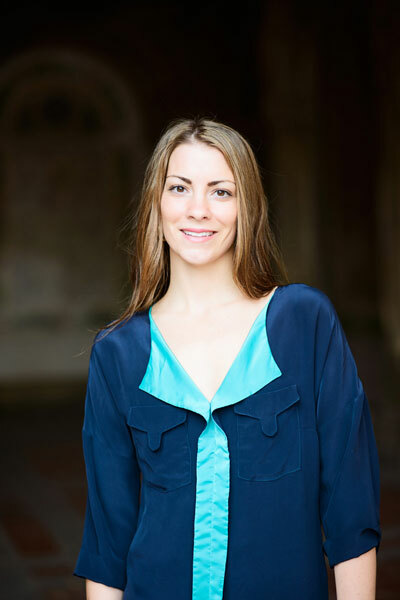 The blouse is designed with short sleeves. 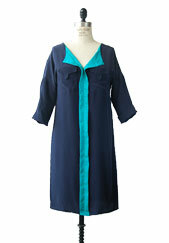 The dress includes cuffed, 3/4-length sleeves and tabbed pockets. The front facing provides an opportunity to use a fun contrasting or complimentary fabric. Share your photos on Instagram with the hashtags #weekendgetawayblouse and #lieslandco. This pattern works best with drapey fabrics like lawn, voile, rayon, silk charmeuse or crepe de chine, satin, and open-weave linen. Chest 36 1/2" 37 1/2" 38 1/2" 39 1/2" 40 1/2" 41 1/2" 43" 44 1/2" 46"
Length, View A * 23" 23 1/2" 24" 24 1/2" 24 3/4" 25" 25 1/4" 25 1/2" 26"
Length, View B * 37 1/2" 38" 38 1/4" 38 1/2" 39" 39 1/4" 39 1/2" 39 3/4" 40"
Hip 38" 39" 40" 41" 42" 43" 44 1/2" 46" 47 1/2"
Perfect simple yet sophisticated blouse! I recently made my first Weekend Getaway blouse and couldn’t be happier with the finished top. I learn something new with each Liesl pattern I make, even though I’ve been sewing clothing for many years. Her instructions for a FBA ( my first try and long overdue to learn) are excellent and gave me a perfect fit. I also loved the super neat interior finish! I will be making more from this pattern and highly recommend it for everyone. A beginner can tackle this and learn good techniques! I've been looking for a basic woven T-shirt pattern but wanted something with a little flair to it. This pattern fits the bill perfectly. And even better it's so easy. I completed my first one within a few hours. It looks great on and I have several more planned. I used this pattern to make a linen duster, per a blog post by Liesl. The directions from the pattern, in combination with the adjustment suggestions in the blog post were easy to follow. The blog post also referenced an Oliver and S tutorial with directions on making side vents. This worked out well too. Great pattern, great suggestions for modifying. After seeing several Weekend Getaway Blouses made by sewists with my body type on Instagram, I knew I had to take the plunge and make one. I followed the tutorial for the Full Bust Adjustment and it was flawless. I had always been nervous to do a FBA, but the instructions were extremely clear and simple and IT WORKED! This blouse is a wonderful make, and I'm so glad I purchased the pattern. 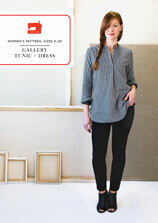 I made 3 Weekend Getaway Blouses within 3 days, and just bought more fabric to make another! I buyed this pattern about one month ago and made already three of them. Love this pattern although I and shortened the V by about 3 cm. Simple but flattering! 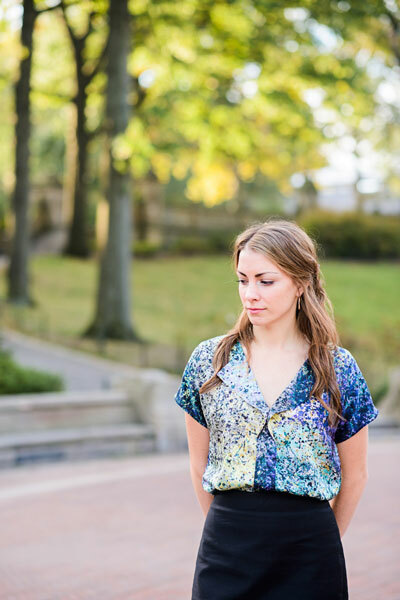 I made this blouse in a couple of evenings, using two coordinating fabrics. I love the shape and fit and the instructions. A great looking blouse that will be a favorite in my wardrobe. I made a fba to the blouse and shortened the V by about an inch. I made it in a double gauze and did some Sashiko embroidery to the front and collar. I just love it and have another one cut out already. Excellent instructions. Easy to make fitting adjustments. Front detail really adds a nice bit of classy detail, although I had to sew an extra inch and a half on the centre front neckline seam to make it decent! I used a semi sheer georgette and have already bought 3 lots of fabric to make up in different versions of the pattern. Wonderful pattern that comes together perfectly, easy to follow instructions. V good flattering fit and the front v neck and middle folds gave the blouse a sophisticated and interesting look. I made mine in a linen without the pockets. Only change I made was to reduce the depth of the V-neckline by about an inch and lengthen the hem by 1.5inches. I made this blouse as soon as I downloaded the pattern. I'm fairly new to sewing, but have looked through a bunch of patterns. This pattern is, by far, the easiest one to follow, which I appreciated. I made the blouse in 100% linen and it worked beautifully. I've worn it repeatedly since I finished it and it fits really well - I love the kimono sleeves! The pattern instructions were complete and I think they would be straight forward enough for a complete beginner. I was cautious about cutting my size per the pattern envelope because the pattern lists several inches of ease in the bust. I did, and it looks nice finished and is comfortable to wear but it does gape considerably when I lean forward. If I make the pattern again, I will likely make a small bust adjustment to help reduce gaping even though I am a B cup. (the pattern instructions do include instructions for bust adjustments in them!) I also found that the past in the back was unflattering to my broad shoulders in the cotton lawn I was using, so replaced with shoulder darts instead. I liked that the pattern was quick to sew, but as I usually make garments that are more fitted through the waist, I haven't decided if I will make it again (if I do I might fit it with darts in the back and add a contrast zip down the center back). The pattern was still will worth the price if only for the facing instructions -- I can see myself using the front and back facing instructions again in other contexts in other patterns. This blouse went together seamlessly! Instructions were detailed and the pictures were a great inclusion! I tweaked the pattern a bit to create more ease in the arms and adjusted the bust dart but everything else I kept the same. Thanks so much for a great pattern. Will definitely make again! Plan to wear it with the Everyday Skirt. Another very professional pattern from Oliver + S. Very simple to construct and elegant in design. As in the Cinema Dress, I loved the method used for increasing the bust size of the blouse; very effective, very simple and a technique transferrable to many other designs. Well done! Perfect for a new Mum! I have just finished my third Weekend Getaway, this time a tunic in black hanky linen (ramie). The subtle shaping gives gentle definition to my post baby body. I feel very tidy and pulled together at a time when many of my clothes make me feel blobby. My dress version was a God send with my last pregnancy, I wore it until 32 weeks. The blouse version, I made in white linen/poly, is a staple for me as I can pull it up and feed in it. The pockets are so stylish, you can leave them off for a super quick sew, but why would you? They really make the blouse pop! The back neck facing is a thing of beauty, so clever. Just trust Liesl's excellent instructions. I look forward to making this again in some very soft draping silk. The pattern is perfect : easy to follow, explanations are clear even for a non native english speaker like me. I really enjoyed sewing this blouse ! I loved my weekend getaway blouse and have just cut out another 2 - one for a friend.The pockets are the cutest I've seen. The only negative is it is very low cut but I sewed the seam up a little higher and although the collar doesn't sit the way it looks in your photo - it is perfectly fine. This is my absolute favourite blouse pattern to date! 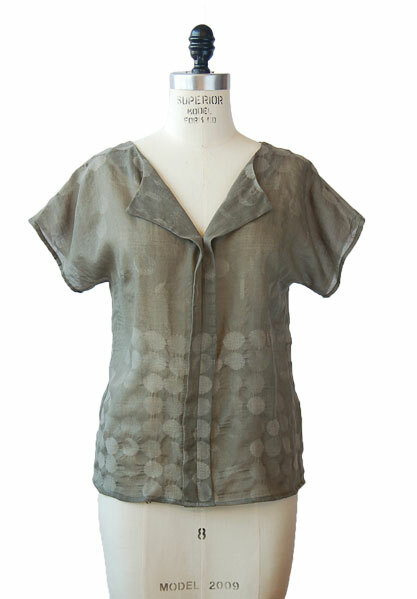 It's a quick and easy sew, and is such a flattering shape. I've sewn it with Liberty Lawn so far, and I think it's a perfect weight. The only change I've made so far is adding an invisible zipper in the front seam to make the shirt breastfeeding friendly! I've also learned that you can squeeze the short sleeve pattern onto 1m of fabric if you don't mind piecing together your facing. Unless you're using a large pattern that has obvious repeats, the seam is hardly noticeable! The Weekend Getaway Blouse PAttern put together two attribute I appreciate very very much: simplicity and creativenenss. Detailed and clear instructions have guided me beautifully. I already know that I'll just make this blouse again and again. Great pattern with clear, simple instructions that resulted in a beautiful blouse. Rather than cutting out based on my measurements I chose "my size" based on the measurements of the finished garment. Very happy with results and can't wait to whip up some more! 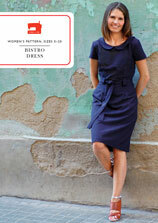 Fabulous, quick-to-sew easy fitting, easy wearing dress. Kimono style sleeves are simple to sew but very flattering. The facings fold back to gently flatter the neck and the pockets are a very clever detail. The dress is subtly shaped to hint at the hips and waist but the action back give good ease. A lovely dress that makes up nicely in fine,draping fabric. If you liked the Lisette Portfolio, you will love this. 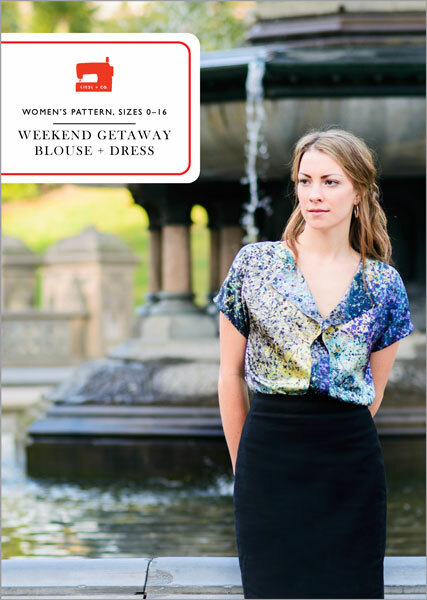 Discussion on the weekend getaway blouse + dress sewing pattern from the Oliver + S Discussion Forums. Find and share more photos on Instagram using the hashtags #weekendgetawayblouse and #lieslandco.